This is the gravestone of Joseph Anton Brunswick, who was the grandfather of my husband's maternal grandmother, Rita Brunswick Tumbush. 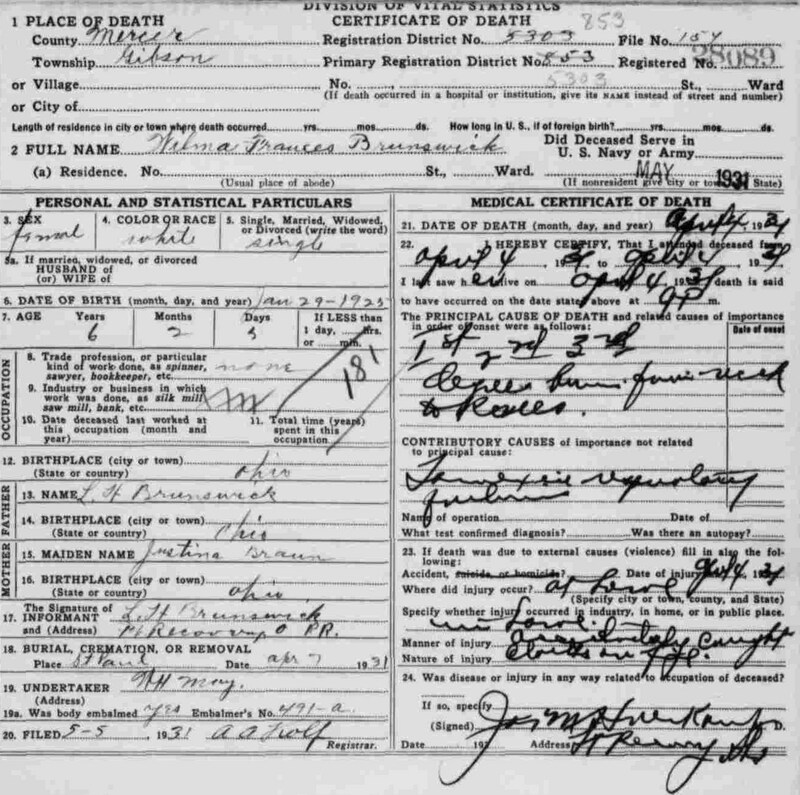 According to county probate birth records, he was born December 3, 1867 in St. John, Ohio (Mercer County), which is very close to Maria Stein. He was the fifth child of Andrew Brunswick, a German immigrant, and Philomena Oldendiek, the daughter of German immigrants. This is an 1863 Civil War Draft Registration List for several counties in western Ohio. My husband's great-great-great-grandfather, Andrew Brunswick, is listed. He immigrated to America from Germany in 1853 under the name of Andreas Braunswig. He married Philomena Oldendick in 1855, with whom he had eight children, and settled down as a farmer in Auglaize County, Ohio. So far, I have been unable to determine whether or not he actually did serve actively in the military during the Civil War. He died in Mercer County, Ohio in 1898. Can you imagine being a recent immigrant to America right before or during the U.S. Civil War? And then all of a sudden being asked to fight and perhaps die in a war for which you have no understanding of the causes? I highly recommend reading this series entitled The Immigrants' Civil War published online by LongIslandWins.com. It's an ongoing blog discussing how the foreign-born population influenced the Civil War and vice versa. Definitely a must-read if you are interested in Civil War and/or immigrant history. Source Citation: National Archives and Records Administration (NARA); Washington, D.C.; Consolidated Lists of Civil War Draft Registration Records (Provost Marshal General's Bureau; Consolidated Enrollment Lists, 1863-1865); Record Group: 110, Records of the Provost Marshal General's Bureau (Civil War); Collection Name: Consolidated Enrollment Lists, 1863-1865 (Civil War Union Draft Records); ARC Identifier: 4213514; Archive Volume Number: 3 of 3. Most people don't generally view cemeteries as pleasant places; some even consider them creepy or unlucky places. For a genealogist, cemeteries and the gravestones within them are invaluable sources of information about people and communities of the past. The information inscribed on gravestones - names, dates of birth and death, relation words such as "wife, "mother," or "son" - can serve as an important starting point in discovering when and where our ancestors lived. Gravestones can also help validate information about ancestors that may have been located in other sources or passed down verbally through the generations. There is a free website called FindAGrave.com that is essentially a catalog of interments from cemeteries all over the world. It is completely run by volunteers who set up memorial pages for friends, relatives, or even complete strangers who have passed on. Once a memorial is posted, anyone can "request a photo" of any particular grave. Volunteers receive photo requests via email from cemeteries located near their homes, and then go out to the cemeteries, search for the grave(s), take photos of them, and post it on website. I found a photo of my great-grandfather's grave on the site, which was helpful to me, because he is buried in Arizona (where none of my family lives). It was taken by a complete stranger who assists in cataloguing cemeteries for the website, and she even managed to track down and post his death certificate as well. I became a volunteer grave photographer a couple of months ago. I like to take photos, and it gives me something different to do with the kids outdoors. Sometimes, I actually think they enjoy walking around the big old gravestones and large trees that are often in the older cemeteries we visit. One day, I tracked down an older grave for a woman living in Kentucky. She sent me a very kind 'thank you' email that was so, so appreciative, it just made my day. She told me the story of how, in the post-Civil War era, her great-great-grandfather enlisted the help of his brother-in-law in discovering the fates of his southern family members. She was trying to find where this brother-in-law ended up and my photograph of his gravestone confirmed the location of his final resting place and seemed to give her some sort of peace. I felt like I had really made a difference in this woman's life. Most of the photo requests I search for, I cannot find. This is especially true of people buried pre-1900. Weathering renders many stones unreadable and, oftentimes, broken stones are not replaced and graves simply become unmarked. Sometimes, it saddens me when I have to tell a person that I could not find the graves of their ancestors. Nobody wants to hear that a family member, even one from generations ago, has been forgotten or neglected, even in death. But still, most people thank me for going to the cemetery and looking, even if it was unsuccessful. Just the other day, I received three emails saying that three of MY grave photo requests had been fulfilled. A volunteer in western Ohio visited three separate cemeteries in Mercer County and photographed graves of Tony's ancestors. What I LOVE about these gravestones is that they are inscribed in German. Through my research, I already knew both of these men were German immigrants, but these stones give me a sense of the culture of the region at the time of death. Andreas Brunswick (first photo) immigrated to America in 1853. He lived for 45 years in western Ohio, yet his gravestone is written in German. So obviously, some communities in the region were still speaking German (or German/English hybrids), even as late 1898. The second photo is the grave of Tony's great-great grandfather, Theodor Tumbusch, who arrived in America in 1861. 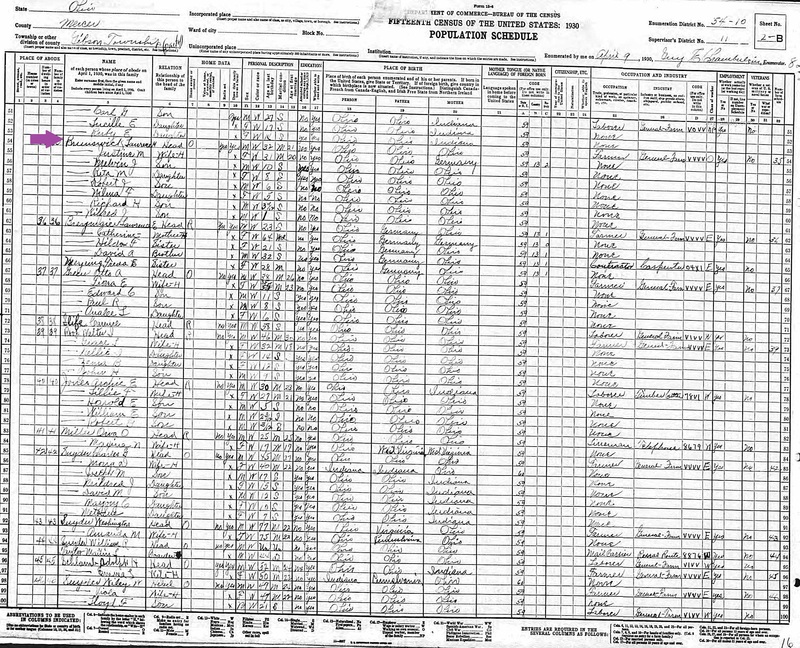 Unfortunately, he died quite young in 1870, so the only real what I call "life" documents relating back to Theodor are his immigrant ship roster and the 1870 U.S. Census. The gravestone has helped me confirm the spelling of his name and his dates of birth and death. In 1819, the U.S. passed a customs law that required ship captains to list the names of each passenger traveling on his ship. Because of this law (and the good fortune that most of them survived to be preserved and catalogued), we actually have pretty good records of the immigrants on each ship passage. Ancestry.com is the best, most-complete online source of records and images of the original ship lists (known as 'manifests') that you can download. If you choose to get a 14-day free trial, these documents are the first ones I would search for, because, apart from visiting the National Archives in Washington, D.C, they are difficult to obtain elsewhere. Below is a sample manifest from 1853 when Andreas Braunswig, Tony's great-great-great-grandfather, came to America. It lists his name, age, country of birth, place of last residence, place to which he is going, occupation, and pieces of baggage. Once in America, he used name "Andrew Brunswick." It was fairly common for immigrants to anglicize their name, so keep that in mind when doing your own searching.